AS A WOMAN OF FAITH, I appreciate the opportunity to begin Holy Week in a visually memorable and contemplative way by attending “The Last Supper Drama” at St. John’s United Church of Christ, Wheeling Township. The drama begins at 8 p.m. on Palm Sunday, April 9, as darkness falls. For 55 years now, parishioners past and present, playing the roles of Jesus’ disciples, have presented this interpretation of Leonardo da Vinci’s The Last Supper painting. Each disciple actor stands and speaks of his personal relationship with Christ. It is moving, powerful and emotional to hear these monologues in the darkness of an aged limestone country church. St. John’s 50th presentation of The Last Supper Drama in the sanctuary. Minnesota Prairie Roots file photo 2012. While the actors alternate from year to year, the script and music remain unchanged from the original of 1963. There is comfort in that, in tradition, in the unchanging story, in the reverent respect and in the focused spotlight on Christ. It’s an inspirational way to start Holy Week, in a mindset of contemplation. The parking lot at St. John’s United Church of Christ, Wheeling Township, is nearly full 20 minutes before the congregation’s annual performance of The Last Supper Drama. Minnesota Prairie Roots file photo. FYI: Click here to see photos and stories from past performances of this drama. St. John’s UCC is located east of Faribault at 19086 Jacobs Avenue, a county road off Minnesota State Highway 60. LIKE ME, I’M CERTAIN you’ve had those moments when you’ve stopped, halted by an unexpected scene. That happened shortly before 9 a.m. Friday as I passed through the living room toward my home office. I noticed shafts of sunlight slanting across the beige carpet in front of the La-Z-Boy recliner. The house had been dark and shuttered for days due to high heat and humidity. But on this blessedly cool early August morning, the windows and front interior door were flung wide, though the drapes were still partially-closed. Through those gaps and openings, the bright morning sun angled a cross onto the floor. I stood there for a moment taking in the scene before grabbing my camera from my office. I needed to document this, to visually imprint the comfort I felt in seeing that cross—a reminder for me of my Christian faith and the hope I have in Christ. He is always with me. In difficult times and in joyful times. Not every sermon comes from the pulpit. On this beautiful morning, a message came in slants of sunshine upon my carpet. FYI: Click here to listen to my current favorite Christian song. Eye of the Storm, by Ryan Stevenson. This stained glass window of the women at Jesus’ empty tomb rises above the altar at Holden Lutheran Church, rural Kenyon, Minnesota. This depiction of the risen Lord centers three stained glass windows above the altar at Trinity Lutheran Church, Wanamingo, Minnesota. 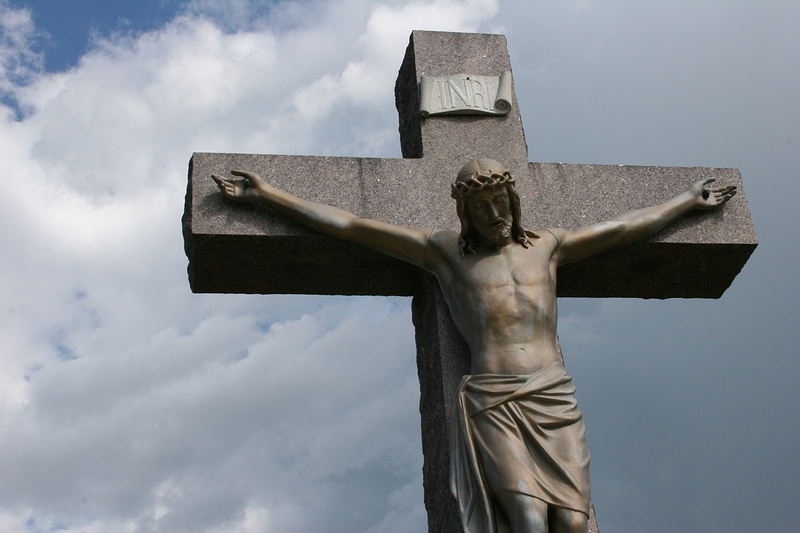 Christ crucified sculpture, St. Michael’s Cemetery, Buckman, MN. Minnesota Prairie Roots file photo, August 2012.